This is a 9 acre property in North Georgia. Two creeks run through the property, come together and flow into the Etowah River. Located right off of GA 400 in Dawsonville. Convenient yet secluded. Four different bamboo groves. One large bamboo grove at the creek with a stream fjord you can drive across. One black bamboo grove at the house. A yellow groove bamboo grove at the drive coming in. Pastures. Rustic home with two story stone fireplace and woodstove. This is a beautiful property with unique attributes for the area. Privacy yet close to amenities. 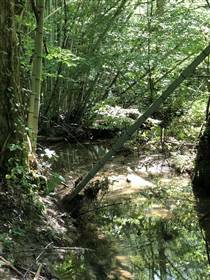 Many natural untouched creek and wooded areas.